Every person has their own favorite. From his/her favorite anime show to his/her fave food to which ever fave that you have. On this week’s Favorite Fridays post, I’ll be sharing my all-time favorite anime shows. Just a few days back, I was binge watching on Fushigi Yûgi or The Mysterious Play (now, Cardcaptor Sakura). My first time seeing that show was when I was in elementary and some parts of my high school days. I never got to watch the whole thing because I had a limit on watching the television. Part of the discipline before was having limited time to watch. The television was the only gadget I had back then. It was the era where smartphones where just for the rich and famous and it was basically invisible at the time. Watching it would mean my rest period or study break and since I’m not that much of a tv person, I had to look at the newspaper for the schedule of the shows. I carefully and strategically managed my schedule in order to be able to watch. Suzaku Seven. From left to right, top to bottom: Nuriko, Chichiri, Mitsukake, Tasuki, Tamahome, Miaka, Hotohori, Chiriko. The story is about two girls who are best friends, Miaka and Yui, who are sucked in a book called The Universe of the Four Gods. It is loosely based on four mythological creatures of China. The show was first aired in the 90s and local tv networks here in the Philippines have aired this as well. It was GMA Network in the late 2000s and TV5 in 2009. It was also aired in Animax (where I first saw it). 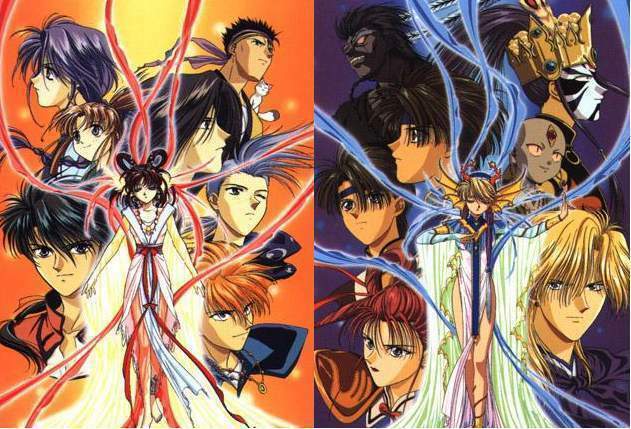 On the left, Miaka and the Suzaku Seven. On the right, Yui and the Seiryû Seven. Miaka and Yui are priestesses of Suzaku and Seiryu respectively. They are tasked to summon the gods and once they did, they will be granted celestial power. However, they could only exercise those powers through three (3) wishes. Details about the characters can be found here. If you want to download, check this. Even though you and your best friend fight, there will always be a way to make amends. Revenge is never the sweetest thing. Never ever love the same boy! It will cause you deep trouble! When you truly love each other, you can vanquish almost anything in the world. Don’t ever think that you are weak. Seriously! Sakura Kinomoto is an elementary student when she discovers a book in her father’s library. She opens it and accidentally releases all the Clow Cards to her world. Cerberus is the guardian of the book also, appoints Sakura to capture all the cards as it may cause evil in the world. This reminds me of the adventures and misadventures of a kid. Getting caught by someone when you accidentally did something wrong. Honestly, I have a toy similar to the key in the first part of the show. I had my mom buy it because truly, I was a fan of Sakura and the show! How I wish I have the Clow Cards as well. There’s a part in the show there Li Syaoran who is a descendant of Clow Reed from HongKong comes to Tokyo. His mission is to retrieve the cards as well. For more details about the show, click here. If you want a copy, see this. Friendship can really stand the test of time and trust. A kid will always have mischievous acts but will surely think of a way to make it up. Sometimes it starts as puppy love then, it eventually grows into true love. Inuyasha, which is also known as Inuyasha: A Feudal Fairy Tale, tells a story about a 15 year old girl named Kagome Higurashi meeting the half-demon, Inuyasha. She is believed to be the reincarnation of the priestess Kikyo who casted a curse on Inuyasha. Kagome lives in Tokyo with her family in the family shrine. She is transported to Sengoku period through the well at their home. The story is somehow similar to Fushigi Yûgi because it crosses dimensions and time. What I like about this is that, even if there are demons existing in the world we can always change for the better. Inuyasha was pretty much judged because he is a half-demon. He was born of a human mother and a dog-demon father. His half-brother (Sesshomaru) somehow despised him. Eventually, the two protagonists fall in love across space and time. It’s quite hard since Kagome is in school in the modern era while Inuyasha is in the feudal era. Read more about the characters here. To have your own copy, see this. It showed me that there is evil in each and every person and we have to deal with it. We may not be born in the era like them but, we sure live in different ones. We love different things and surely, that’s just the start. Falling in love with the characters is easy but learning how they came to be is the challenge. Some feel for them, some hate them but in the end, we are our own characters of our own stories. Truly, no matter how to try to suppress your feelings for someone, it will surely and eventually win over you. If the bond is strong between you, then it can conquer anything. Detective Conan / Case Closed | Many of the main characters as they appear in the anime. The second row from left to right: Kazuha Toyama, Harley Hartwell, Serena Sebastian, Rachel Moore, Richard Moore, Eva Kadan, and Hershel Agasa. First row from left to right: George Kojima, Mitch Tsuburaya, Conan Edogawa, Anita Hailey, and Amy Yoshida. The story is about a young detective, Shinichi Kudo, who was drugged by mysterious guys in black clothing. The drug immediately shrunk him into a child’s body. He appears to be an elementary student. Concealing his identity was his primary course of action. With the help of Dr. Agasa, he was given a new identity as Conan Edogawa. He has been living with Ran Mouri and his father in order to investigate on the people who shrunk him. I first came across this series while watching Fushigi Yûgi on Animax back then. It was the next show so I just tried watching it. I immediately liked it and got hooked since. Just the past few months, I was able to watch the episodes from the year it first aired. It was back in 1996 and it was a challenge to find sites and copies for it. This series is similar to Sherlock Holmes and maybe that’s why it’s an all-time favorite of mine. Plus it is on its 25th season. Imagine that! Mysteries to be solved just like in Sherlock Holmes. Making someone think about how can a crime be solved and who’s the culprit is one of the greatest challenges anyone could face especially if it’s a locked room murder or something else. The bond shared by Shinichi and Ran is really something. From being childhood friends to secret love? Anyone would want that! It amazes me that even Shinichi (who is now Conan) still finds a way to communicate with Ran through his supposedly normal voice. It teaches people not to give up easily. Challenges are always there and we must deliberately face them than to turn them down or quit. These all-time favorite anime shows have been teaching me quite a few lessons. Even if at my age, I never regret watching these. For a point, they surely entertain me, make me cry sometimes and make me laugh. People will surely think that I’m weird because at my age, I still watch these kind of shows but it’s just what I like. What is/are your favorite anime show/s or just favorite show/s? P.S. Images depicting my favorite anime shows are from the internet. I have to admit, anime is not for me, but that doesn’t stop me from admiring how cute they look, with their large round eyes. I think it is a fascination of Japanese people on people with round eyes. Back in the day, the Japanese I watched were all robots… Voltes V… etc. OMG! I’ve watched these shows when I was younger. I love anime’s, I can watch them the whole day and never get bored of watching it. I was happy to read your article as I no longer watch them now. Of course, the remote no longer belongs to me but to my kids. The TV is usually set to Doc Mcstuffins. Thanks for sharing. I rarely watch anime. (I’ve seen the movie Paprika). But I should invest some more time to get to know Anime better. Well if I start on it, I’ll try out some of your tips. 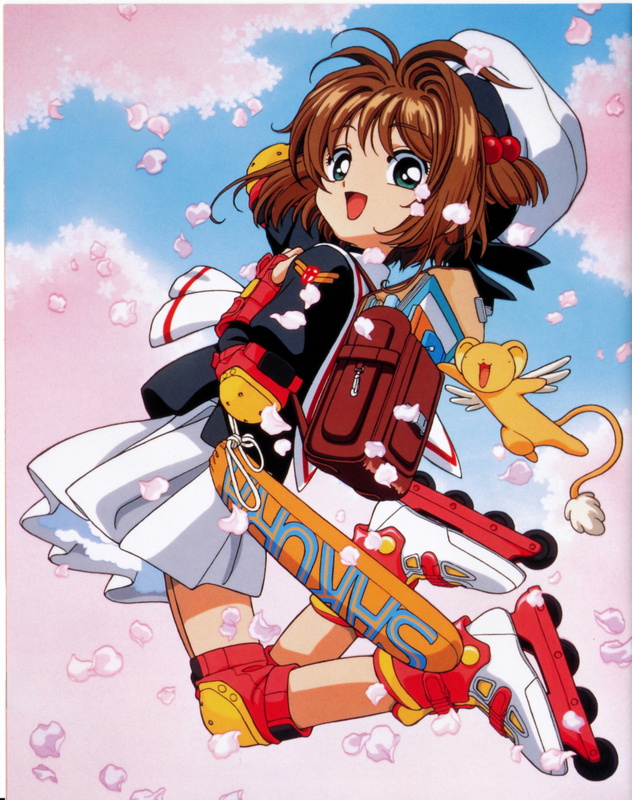 I think I might like Cardcaptor Sakura. Thanks for the tips! I’ve never watched anime that much. They came around when I was already in school so I never got to watch them on TV. I’m familiar of Mortal Kombat and Samurai X. But I like how they look. That Sakura is so cute! These look interesting! I’m not really a big fan of anime but maybe I should try to watch one hehe. Might like it! Havent seen any anime when i was growing up. Never enjoyed watching tv programs as well when i was young. Perhaps my mom brainwashed me that much that books are better than tv. Anyway, my boys watch tv programs a lot. I just do not know of theres any anime. But they read manga books which I believe are pretty much the same(?). Such clueless here. But are Sailor Moon and astroboy considered as anime? i have seen them before. Ehehe. Make that Throwback Friday! These are my favorite anime too when I was young. Oh! I miss them. Woah. There was a Transformers anime show? Didn’t hear about that. Hehe! Yes to Detective Conan! Ahh! These animes brings back childhood memories! I used to watch Inuyasha, Cardcaptor Sakura, and Detective Conan as kid. I was so obsessed with them so I’d even wake up early in the morning or rush my way home from school just so I can watch them. Nostalgia at its finest! Haha! I love animes and in the opposite of others, I still in my twenties like to watch it. Have you ever watched Ao No Exorcist? I don’t know if it’s your style or not, but I loved it!